This article is about a list of wrestlers who have held the current WWE Championship. For a list of wrestlers who have held the now-retired World Heavyweight Championship, see List of World Heavyweight Champions (WWE). For a list of current title holders in WWE, see List of current champions in WWE. The WWE Championship is a professional wrestling world heavyweight championship in WWE, currently on the SmackDown brand. It is the first world title established in WWE, having been introduced in 1963 as the World Wide Wrestling Federation (WWWF) World Heavyweight Championship. The promotion was renamed World Wrestling Federation (WWF) in 1979 and ended its affiliation with the National Wrestling Alliance (NWA) in 1983, with the title also renamed to reflect the changes. In 2001, it was unified with the World Championship (formerly the WCW World Heavyweight Championship) following the WWF's buyout of World Championship Wrestling (WCW) and became the Undisputed WWF Championship. In 2002, the WWF was renamed World Wrestling Entertainment (WWE) and split its roster into two brands, Raw and SmackDown. The title, now renamed WWE Championship, was then designated to the SmackDown brand while WWE established an alternate world title known as the World Heavyweight Championship for the Raw brand. A third alternate world title, the ECW World Heavyweight Championship, was reactivated for the ECW brand in 2006. It was vacated and decommissioned when the ECW brand disbanded in 2010. When WWE Champion Randy Orton defeated World Heavyweight Champion John Cena at the TLC: Tables, Ladders & Chairs pay-per-view event on December 15, 2013, the World Heavyweight Championship was unified with the WWE Championship, resulting in the retiring of the former and the renaming of the latter to the WWE World Heavyweight Championship. On June 27, 2016, the name was shortened back to the WWE Championship before assuming the WWE World Championship name on July 26, when the brand extension returned. It became designated to the SmackDown brand and WWE again established an alternate world title known as the WWE Universal Championship for the Raw brand. In December 2016, WWE again shortened the title's name back to WWE Championship. The championship is generally contested in professional wrestling matches, in which participants execute scripted finishes rather than contend in direct competition. Some reigns were held by champions using a ring name while others use their real name. The first champion was Buddy Rogers, who won the championship in 1963. The champion with the single longest reign is Bruno Sammartino with a reign of 2,803 days while the record for longest combined reign is also held by Sammartino at 4,040. The current champion is Kofi Kingston, who is in his first reign. He won the championship by defeating Daniel Bryan at WrestleMania 35 on April 7, 2019. 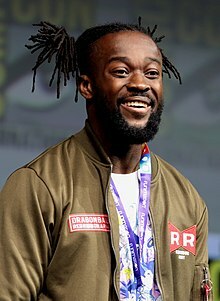 With this win, Kingston became the first African-born world champion in WWE history. Overall, there have been 51 different official champions, with John Cena having the most reigns at thirteen. Eight men in history have held the championship for a continuous reign of one year (365 days) or more: Bruno Sammartino (who achieved the feat on two separate occasions), Pedro Morales, Bob Backlund, Hulk Hogan, Randy Savage, John Cena, CM Punk and AJ Styles. The Rock February 25, 2001 No Way Out Las Vegas, NV 6 7001350000000000000♠35 7001350000000000000♠35 After the WWF purchased World Championship Wrestling (WCW) in March 2001, the WCW Championship became a second concurrently active world championship in the WWF. Edge July 3, 2006 Raw Philadelphia, PA 2 7001760000000000000♠76 7001760000000000000♠76 This was a triple threat match also involving John Cena. John Cena September 17, 2006 Unforgiven Toronto, ON 3 7002380000000000000♠380 7002380000000000000♠380 This was a Tables, Ladders and Chairs match. Triple H April 27, 2008 Backlash Baltimore, MD 7 7002210000000000000♠210 7002210000000000000♠210 This was a fatal four-way elimination match also involving John Cena and John Bradshaw Layfield. John Cena September 13, 2009 Breaking Point Montreal, QC 4 7001210000000000000♠21 7001210000000000000♠21 This was an "I quit" match. John Cena October 25, 2009 Bragging Rights Pittsburgh, PA 5 7001490000000000000♠49 7001490000000000000♠49 This was a 60-minute Anything Goes Iron Man match in which Cena won 6-5. — Vacated July 18, 2011 Raw Green Bay, WI — — — The title was vacated due Punk leaving WWE. Rey Mysterio July 25, 2011 Raw Hampton, VA 1 <1 <1 Defeated The Miz in a tournament final to crown a new champion. Seth Rollins March 29, 2015 WrestleMania 31 Santa Clara, CA 1 7002220000000000000♠220 7002219000000000000♠219 Rollins cashed in his Money in the Bank contract during a singles match between Lesnar and Roman Reigns, making it a triple threat match and subsequently pinned Reigns to win the match. ^ "WWE Entertainment, Inc. Acquires WCW from Turner Broadcasting". WWE. March 21, 2001. Archived from the original on April 8, 2005. Retrieved October 17, 2008. ^ a b "Chris Jericho Becomes First Undisputed Champion of Professional Wrestling". WWE. December 9, 2001. Archived from the original on January 17, 2006. Retrieved October 17, 2008. ^ a b c d "World Wrestling Federation Entertainment Drops The "F" To Emphasize the "E" for Entertainment". WWE. May 6, 2002. Archived from the original on March 21, 2005. Retrieved October 17, 2008. ^ "WWE Entertainment To Make RAW and SmackDown Distinct Television Brands". WWE. March 27, 2002. Archived from the original on March 21, 2005. Retrieved October 17, 2008. ^ "WWE Championship History". WrestleView. Retrieved October 17, 2008. ^ "Retired Championships". WWE. Archived from the original on January 9, 2016. Retrieved November 22, 2015. ^ Johnson, Mike. "Future of top WWE championship already hinted at". Pro Wrestling Insider. Retrieved June 29, 2016. ^ a b c "WWE Championship". WWE. Archived from the original on December 14, 2016. Retrieved December 13, 2016. ^ "WWE Championship Title History". WWE. Retrieved October 17, 2008. ^ a b Nemer, Paul (September 2, 2002). "Full WWE Raw Results – 9/2/02". WrestleView. Retrieved November 24, 2009. ^ "WWE Championship". WWE. Archived from the original on 29 June 2016. Retrieved 29 June 2016. ^ Fernandes, Steven (28 June 2016). "WWE Championship name change official, Bellas and more news". Pro Wrestling Insider. Retrieved 29 June 2016. ^ "WWE World Championship". WWE. Retrieved 26 July 2016. ^ "Buddy Rogers's first reign". WWE. Archived from the original on 2005-08-28. Retrieved 2007-03-17. ^ a b c d e f g Melok, Bobby Melok (December 12, 2012). "The secret history of phantom title changes". WWE. Retrieved December 3, 2018. ^ "Buddy Rogers". WWE. Retrieved November 15, 2016. So in 1961, when he dethroned Pat O'Connor for the NWA World Championship in Chicago's Comiskey Park [...] . ^ "1963". TheHistoryofWWE.com. Retrieved November 15, 2016. - 1/25/63: The World Wide Wrestling Federation (WWWF) was formed when promoters in the Northeast refused to acknowledge Rogers' one-fall loss of the NWA championship. The real reason was that Vince McMahon Sr. wanted to keep Rogers on as his territory's champion since so much money was being made from his title run. Rogers continued to wrestle as the "world champion" in the Northeast region and was recognized as the "WWWF World Champion" starting in April . ^ "1963". TheHistoryofWWE.com. Retrieved November 15, 2016. World Champion Buddy Rogers defeated Bobo Brazil . ^ "1963". TheHistoryofWWE.com. Retrieved November 15, 2016. WWWF World Champion Buddy Rogers fought Bruno Sammartino to a no contest; it was prior to this bout that Rogers received the WWWF World Title though he had been billed as 'world champion' since January . ^ "WWE World Championship". WWE. Retrieved November 15, 2016. ^ "Bruno Sammartino's first reign". WWE. Archived from the original on 2007-03-18. Retrieved 2007-03-17. ^ "Ivan Koloff's first reign". WWE. Archived from the original on 2005-07-15. Retrieved 2011-07-15. ^ "Pedro Morales's first reign". WWE. Archived from the original on 2005-12-10. Retrieved 2007-03-17. ^ "Stan Stasiak's first reign". WWE. Archived from the original on 2005-12-10. Retrieved 2007-03-17. ^ "Bruno Sammartino's second reign". WWE. Archived from the original on 2005-07-24. Retrieved 2007-03-17. ^ "Billy Graham's first reign". WWE. Archived from the original on 2005-07-24. Retrieved 2007-03-17. ^ "Bob Backlund's first reign". WWE. Archived from the original on 2005-11-29. Retrieved 2007-03-17. ^ "Bob Backlund bio". WWE. Retrieved 2012-08-20. ^ a b c d e f g h "WWWF/WWF/WWE Heavyweight Title History". The History of WWE.com. Retrieved December 3, 2018. ^ "The Iron Sheik's first reign". WWE. Archived from the original on 2005-12-31. Retrieved 2007-03-17. ^ a b c "Andre the Giant's first reign". WWE. Archived from the original on 2005-06-24. Retrieved 2007-03-20. ^ "Randy Savage's first reign". WWE. Archived from the original on 2005-06-24. Retrieved 2007-03-20. ^ "Hulk Hogan's second reign". WWE. Archived from the original on 2005-06-24. Retrieved 2007-03-20. ^ "The Ultimate Warrior's first reign". WWE. Archived from the original on 2005-07-03. Retrieved 2007-03-20. ^ "Sgt. Slaughter's first reign". WWE. Archived from the original on 2005-12-10. Retrieved 2007-03-20. ^ "Hulk Hogan's third reign". WWE. Archived from the original on 2005-06-24. Retrieved 2007-03-20. ^ "The Undertaker's first reign". WWE. Archived from the original on 2005-06-24. Retrieved 2007-03-20. ^ a b "Hulk Hogan's fourth reign". WWE. Archived from the original on 2005-07-23. Retrieved 2007-03-20. ^ "Ric Flair's first reign". WWE. Archived from the original on 2005-07-23. Retrieved 2007-03-20. ^ "Randy Savage's second reign". WWE. Archived from the original on 2005-12-10. Retrieved 2007-03-20. ^ "Ric Flair's second reign". WWE. Archived from the original on 2005-07-17. Retrieved 2007-03-20. ^ "Bret Hart's first reign". WWE. Archived from the original on 2005-12-31. Retrieved 2007-03-20. ^ "Yokozuna's first reign". WWE. Archived from the original on 2005-12-10. Retrieved 2007-03-20. ^ "Hulk Hogan's fifth reign". WWE. Archived from the original on 2005-07-19. Retrieved 2007-03-20. ^ "Yokozuna's second reign". WWE. Archived from the original on 2005-11-27. Retrieved 2007-03-20. ^ "Bret Hart's second reign". WWE. Archived from the original on 2005-07-16. Retrieved 2007-03-20. ^ "Bob Backlund's second reign". WWE. Archived from the original on 2005-07-17. Retrieved 2007-03-20. ^ "Diesel's first reign". WWE. Archived from the original on 2005-07-17. Retrieved 2007-03-20. ^ "Bret Hart's third reign". WWE. Archived from the original on 2005-07-17. Retrieved 2007-03-20. ^ "Shawn Michaels's reign". WWE. Archived from the original on 2005-07-24. Retrieved 2007-03-21. ^ "Sycho Sid's first reign". WWE. Archived from the original on 2005-11-23. Retrieved 2007-03-21. ^ a b "Shawn Michaels's second reign". WWE. Archived from the original on 2005-06-23. Retrieved 2007-03-21. ^ "Bret Hart's fourth reign". WWE. Archived from the original on 2005-07-19. Retrieved 2007-03-21. ^ "Sycho Sid's second reign". WWE. Archived from the original on 2005-12-10. Retrieved 2007-03-21. ^ "The Undertaker's second reign". WWE. Archived from the original on 2005-06-24. Retrieved 2007-03-21. ^ "Bret Hart's fifth reign". WWE. Archived from the original on 2005-11-29. Retrieved 2007-03-21. ^ "Shawn Michaels's third reign". WWE. Archived from the original on 2005-06-24. Retrieved 2007-03-21. ^ "Steve Austin's first reign". WWE. Archived from the original on 2005-07-24. Retrieved 2007-03-22. ^ "Kane's first reign". WWE. Archived from the original on 2005-06-23. Retrieved 2007-03-22. ^ a b "Steve Austin's second reign". WWE. Archived from the original on 2005-06-23. Retrieved 2007-03-22. ^ "The Rock's first reign". WWE. Archived from the original on 2005-11-25. Retrieved 2007-03-22. ^ "Mankind's first reign". WWE. Archived from the original on 2005-11-29. Retrieved 2007-03-22. ^ "The Rock's second reign". WWE. Archived from the original on 2005-07-17. Retrieved 2007-03-22. ^ "Mankind's second reign". WWE. Archived from the original on 2005-11-06. Retrieved 2007-03-22. ^ "The Rock's third reign". WWE. Archived from the original on 2005-11-25. Retrieved 2007-03-22. ^ "Steve Austin's third reign". WWE. Archived from the original on 2005-11-06. Retrieved 2007-03-22. ^ "The Undertaker's third reign". WWE. Archived from the original on 2005-07-30. Retrieved 2007-03-22. ^ "Steve Austin's fourth reign". WWE. Archived from the original on 2005-11-29. Retrieved 2007-03-22. ^ "Mankind's third reign". WWE. Archived from the original on 2005-11-06. Retrieved 2007-03-22. ^ "Triple H's first reign". WWE. Archived from the original on 2005-06-24. Retrieved 2007-03-22. ^ a b "Mr. McMahon's first reign". WWE. Archived from the original on 2005-11-06. Retrieved 2007-03-22. ^ "Triple H's second reign". WWE. Archived from the original on 2005-07-17. Retrieved 2007-03-22. ^ "The Big Show's first reign". WWE. Archived from the original on 2005-10-01. Retrieved 2007-03-22. ^ "Triple H's third reign". WWE. Archived from the original on 2005-07-18. Retrieved 2007-03-22. ^ "The Rock's fourth reign". WWE. Archived from the original on 2005-11-30. Retrieved 2007-03-22. ^ "WWE Championship - The Rock". WWE. Archived from the original on 2005-11-30. Retrieved 2007-03-22. ^ "The Rock's fifth reign". WWE. Archived from the original on 2005-10-01. Retrieved 2007-03-22. ^ "Kurt Angle's first reign". WWE. Archived from the original on 2005-09-24. Retrieved 2007-03-22. ^ "The Rock's sixth reign". WWE. Archived from the original on 2005-09-24. Retrieved 2007-03-22. ^ "Steve Austin's fifth reign". WWE. Archived from the original on 2005-10-01. Retrieved 2007-03-22. ^ "Kurt Angle's second reign". WWE. Archived from the original on 2005-07-18. Retrieved 2007-03-22. ^ "Steve Austin's sixth reign". WWE. Archived from the original on 2006-01-14. Retrieved 2007-03-22. ^ "Chris Jericho's first reign". WWE. Archived from the original on 2005-11-06. Retrieved 2007-03-22. ^ "Triple H's fifth reign". WWE. Archived from the original on 2005-06-24. Retrieved 2007-03-22. ^ "Hulk Hogan's sixth reign". WWE. Archived from the original on 2005-06-24. Retrieved 2007-03-22. ^ "The Undertaker's fourth reign". WWE. Archived from the original on 2005-07-24. Retrieved 2007-03-22. ^ "The Rock's seventh reign". WWE. Archived from the original on 2005-07-26. Retrieved 2007-03-22. ^ "Brock Lesnar's first reign". WWE. Archived from the original on 2005-07-21. Retrieved 2007-03-22. ^ "The Big Show's second reign". WWE. Archived from the original on 2005-07-17. Retrieved 2007-03-22. ^ "Kurt Angle's third reign". WWE. Archived from the original on 2005-07-18. Retrieved 2007-03-22. ^ "Brock Lesnar's second reign". WWE. Archived from the original on 2005-07-31. Retrieved 2007-03-22. ^ "Kurt Angle's fourth reign". WWE. Archived from the original on 2005-07-19. Retrieved 2007-03-22. ^ "Brock Lesnar's third reign". WWE. Archived from the original on 2005-07-15. Retrieved 2007-03-22. ^ "Eddie Guerrero's first reign". WWE. Archived from the original on 2005-06-30. Retrieved 2007-03-22. ^ Roopansingh, Jaya (2004-02-16). "Guerrero crowned at No Way Out". SLAM! Wrestling. Retrieved 2009-11-24. ^ "John "Bradshaw" Layfield's first reign". WWE. Archived from the original on 2005-07-15. Retrieved 2007-03-17. ^ Martin, Adam (2004-06-27). "WWE Great American Bash (SmackDown) PPV Results – 6/27/04". WrestleView. Retrieved 2009-11-24. ^ "John Cena's first reign". WWE. Archived from the original on 2005-06-24. Retrieved 2007-03-17. ^ Martin, Adam (2005-04-03). "WWE WrestleMania 21 PPV Results – 4/3/05 – Los Angeles, CA". WrestleView. Retrieved 2009-11-24. ^ "Edge's first reign". WWE. Archived from the original on 2006-01-11. Retrieved 2007-03-17. ^ Sokol, Chris (2006-01-09). "Edge surprise champ after Revolution". SLAM! Wrestling. Retrieved 2009-11-24. ^ "John Cena's second reign". WWE. Archived from the original on 2006-02-04. Retrieved 2007-03-17. ^ Martin, Adam (2006-01-29). "Royal Rumble (RAW/SmackDown) PPV Results – 1/29/06 – Miami, FL". WrestleView. Retrieved 2009-11-24. ^ "Rob Van Dam's first reign". WWE. Archived from the original on 2006-07-19. Retrieved 2007-03-17. ^ Martin, Adam (2006-06-11). "ECW One Night Stand PPV Results – 6/11/06". WrestleView. Retrieved 2009-11-24. ^ "Edge's second reign". WWE. Archived from the original on 2006-07-05. Retrieved 2007-03-17. ^ Plummer, Dave. "Raw: Edge wins WWE title". SLAM! Wrestling. Retrieved 2009-11-24. ^ "John Cena's third reign". WWE. Archived from the original on 2012-05-09. Retrieved 2012-08-03. ^ "Mr. McMahon vacates Cena's WWE Championship". WWE. 2007-10-02. Retrieved 2012-08-03. ^ "Randy Orton's first reign". WWE. Archived from the original on 2007-10-11. Retrieved 2007-10-07. ^ a b c "WWE title magic at No Mercy". The Sun. 2007-10-09. Archived from the original on 2007-10-11. Retrieved 2009-11-24. ^ "Triple H's sixth reign". WWE. Archived from the original on 2007-10-11. Retrieved 2007-10-07. ^ "Randy Orton's second reign". WWE. Archived from the original on 2007-10-11. Retrieved 2007-10-07. ^ "Triple H's seventh reign". WWE. Archived from the original on 2008-04-30. Retrieved 2008-04-28. ^ Hillhouse, Dave. "HHH reigns again after Backlash". SLAM! Wrestling. Retrieved 2009-11-24. ^ "Edge's third reign". WWE. Archived from the original on 2008-12-04. Retrieved 2008-11-24. ^ "Your new WWE champions..." The Sun. 2008-11-25. Archived from the original on 2008-12-10. Retrieved 2009-11-24. ^ "Jeff Hardy's first reign". WWE. Archived from the original on 2008-12-17. Retrieved 2008-12-15. ^ Keller, Wade (2008-12-14). "Keller's WWE Armageddon PPV report 12/14: Ongoing "virtual time" coverage of live event – John Cena vs. Chris Jericho". PWTorch. Retrieved 2009-11-24. ^ "Edge's fourth reign". WWE. Archived from the original on 2009-02-21. Retrieved 2009-01-26. ^ Martin, Adam (2009-01-25). "Royal Rumble PPV Results – 1/25/09". WrestleView.com. Archived from the original on 2012-10-01. Retrieved 2011-01-04. ^ "Triple H's eighth reign". WWE. Archived from the original on 2009-02-25. Retrieved 2009-04-26. ^ Martin, Adam (2009-02-15). "WWE No Way Out Results – 2/15/09". WrestleView. Archived from the original on 2012-09-29. Retrieved 2011-01-04. ^ "Orton's third reign". WWE. Archived from the original on 2009-04-30. Retrieved 2009-04-27. ^ Martin, Adam (2009-04-26). "Backlash PPV Results – 4/26/09". WrestleView. Archived from the original on 2012-10-01. Retrieved 2011-01-04. ^ "Batista's first reign". WWE. Archived from the original on 2009-06-11. Retrieved 2009-04-27. ^ Martin, Adam (2009-06-07). "Extreme Rules PPV Results – 6/7/09". WrestleView. Archived from the original on 2012-10-01. Retrieved 2011-01-04. ^ "Wounded Animal". WWE. 2009-06-09. Archived from the original on June 12, 2009. Retrieved 2009-06-09. ^ "Orton's fourth reign". WWE. Archived from the original on 2009-06-19. Retrieved 2009-06-16. ^ Golden, Hunter (2009-06-16). "Raw Results – 6/15/09". WrestleView. Archived from the original on 2012-10-01. Retrieved 2011-01-04. ^ "Cena's fourth reign". WWE. Archived from the original on 2009-09-22. Retrieved 2009-09-13. ^ Martin, Adam (2009-09-13). "Breaking Point PPV Results – 9/13/09". WrestleView. Archived from the original on 2012-10-01. Retrieved 2011-01-04. ^ "Orton's fifth reign". WWE. Archived from the original on 2009-10-08. Retrieved 2009-10-25. ^ Martin, Adam (2009-10-04). "Hell in a Cell PPV Results – 10/4/09". WrestleView. Archived from the original on 2012-09-28. Retrieved 2011-01-04. ^ "Cena's fifth reign". WWE. Archived from the original on 2009-10-29. Retrieved 2009-10-25. ^ Martin, Adam (2009-10-25). "Bragging Rights Results – 10/25/09". WrestleView. Archived from the original on 2012-10-01. Retrieved 2011-01-04. ^ "Sheamus' first reign". WWE. Archived from the original on 2009-12-17. Retrieved 2009-12-14. ^ Martin, Adam (2011-01-04). "WWE TLC PPV Results – 12/13/09". Wrestle View. Archived from the original on 2012-10-01. Retrieved 2010-01-11. ^ "Cena's sixth reign". WWE. Archived from the original on 2010-02-25. Retrieved 2009-02-21. ^ "Batista's second reign". WWE. Archived from the original on 2010-02-25. Retrieved 2009-02-21. ^ "John Cena's seventh reign". WWE. Archived from the original on 2010-04-01. Retrieved 2010-03-28. ^ "Sheamus' second reign". WWE. Archived from the original on 2010-06-25. Retrieved 2010-09-20. ^ "Randy Orton's sixth reign". WWE. Archived from the original on 2010-09-24. Retrieved 2010-09-20. ^ "The Miz's first reign". WWE. Archived from the original on 2010-12-08. Retrieved 2010-11-22. ^ "John Cena's eighth reign". WWE. Archived from the original on 2011-05-06. Retrieved 2011-05-24. ^ "CM Punk's first reign". WWE. Archived from the original on 2011-10-07. Retrieved 2011-07-19. ^ Caldwell, James. "Caldwell's WWE Raw results 7/18: Ongoing "virtual-time" coverage of live Raw – Money in the Bank PPV fall-out, McMahon opens Raw". Pro Wrestling Torch. Retrieved November 19, 2013. ^ "Rey Mysterio's first reign". WWE. Archived from the original on 2011-09-29. Retrieved 2011-07-25. ^ "John Cena's ninth reign". WWE. Archived from the original on 2011-10-07. Retrieved 2011-07-27. ^ Woartman, James. "CM Punk def. John Cena; Alberto Del Rio cashed in Raw Money in the Bank briefcase (New Undisputed WWE Champion)". WWE. Retrieved 2011-08-14. ^ "Alberto Del Rio's first reign". WWE. Archived from the original on 2011-10-07. Retrieved 2011-08-15. ^ "John Cena's tenth reign". WWE. Archived from the original on 2011-09-24. Retrieved 2011-09-19. ^ "Alberto Del Rio's second reign". WWE. Archived from the original on 2011-10-06. Retrieved 2011-10-03. ^ "CM Punk's second reign". WWE. Archived from the original on 2011-11-24. Retrieved 2012-02-19. ^ "The Rock's eighth reign". WWE. Archived from the original on 2013-01-31. Retrieved 2013-01-28. ^ "John Cena's eleventh reign". WWE. Retrieved 2013-04-08. ^ "Daniel Bryan's first reign". WWE. Archived from the original on 2013-08-22. Retrieved 2013-08-19. ^ "Randy Orton's seventh reign". WWE. Archived from the original on 2013-08-22. Retrieved 2013-09-16. ^ "Daniel Bryan's second reign". WWE. Archived from the original on 2013-09-20. Retrieved 2013-09-16. ^ Benigno, Anthony. "WWE COO Triple H stripped Daniel Bryan of the WWE Championship". Retrieved September 16, 2013. ^ "Randy Orton's eighth reign". WWE. Archived from the original on December 3, 2013. Retrieved October 27, 2013. ^ "Daniel Bryan's third reign". WWE. Archived from the original on 2014-04-10. Retrieved 2014-04-06. ^ "Stephanie McMahon strips Daniel Bryan of the WWE World Heavyweight Championship". WWE. Retrieved June 9, 2014. ^ "John Cena's twelfth reign". WWE. Archived from the original on July 12, 2014. Retrieved June 29, 2014. ^ "Brock Lesnar's fourth reign". WWE. Archived from the original on August 20, 2014. Retrieved August 17, 2014. ^ "Seth Rollins' first reign". WWE. Archived from the original on April 2, 2015. Retrieved March 29, 2015. ^ "Seth Rollins suffers knee injury, new WWE World Heavyweight Champion to be crowned at Survivor Series". WWE. November 5, 2015. Archived from the original on November 6, 2015. Retrieved November 5, 2015. ^ "Roman Reigns' first reign". WWE. Archived from the original on November 23, 2015. Retrieved November 22, 2015. ^ "Sheamus' third reign". WWE. Archived from the original on November 23, 2015. Retrieved November 22, 2015. ^ "Roman Reigns' second reign". WWE. Archived from the original on 17 December 2015. Retrieved 15 December 2015. ^ "Triple H's ninth reign". WWE. Archived from the original on 25 January 2016. Retrieved 15 January 2015. ^ a b Caldwell, James. "6/19 WWE MITB PPV Results – CALDWELL's Complete Live Report". Pro Wrestling Torch. Retrieved June 19, 2016. ^ Pappolla, Ryan (November 7, 2017). "AJ Styles def. Jinder Mahal to win the WWE Championship". WWE. Retrieved December 3, 2017. ^ Barnett, Jake (November 13, 2018). "11/13 Barnett's WWE Smackdown Live TV Review: WWE Survivor Series shakeup due to Becky Lynch's injury, New Day vs. Big Show, Sheamus, and Cesaro, the final push for Sunday's event". Pro Wrestling Dot Net. Retrieved November 13, 2018. ^ Powell, Jason. "WrestleMania 35 results: Powell's live review of Ronda Rousey vs. Becky Lynch vs. Charlotte Flair for the Raw and Smackdown Women's Titles, Daniel Bryan vs. Kofi Kingston for the WWE Championship, Brock Lesnar vs. Seth Rollins for the WWE Universal Championship, Batista vs. Triple H, AJ Styles vs. Randy Orton". Pro Wreslting Dot Net. Retrieved April 7, 2018.